better basic academic skills (Abu-Rabia, 2000). 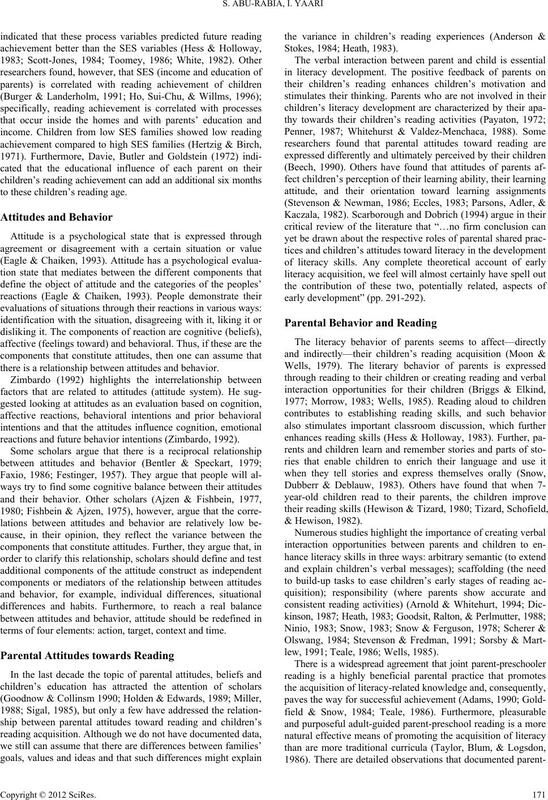 influence on the reading achievement of first-grade children. home a major influence in this stage of life (Lombard, 1994). others (Share, Jorm, Maclean, Matthews, & Waterman, 1983). to these children’s reading age. there is a relationship between attitudes and behavior. reactions and future behavior intentions (Zimbardo, 1992). terms of four elements: action, target, context and time. lew, 1991; Teale, 1986; Wells, 1985). pothesis (Scarborough & Dobrich, 1994). kinson, Wallis, Prince, & Harvey, 1982; Wolf, 1964). havior and not to learning environment. building the knowledge required for eventual success in reading? reading achievement of their first-grade children. rate independent influence on reading). thers). Then pupils were selected at random from each class. low SES. Most of the parents work in unprofessional jobs. final version consisted of 39 items divided into 6 concepts. ents’ behavior was defined according to 4 measures. to identify the real journal names. and 4 = very important. scale of 5 = very much to 1 = not at all. variables, and Pearson intercorrelation matrix, see Appendix. text consisted of 36 words. Children had to read them aloud. They were tested for reading accuracy. were the number of errors. reading achievement was (r = –0.44, p < 0.005). achievement in a mediating model (see model 2). (model 1) and the mediating model (model 2). and behavior on reading achievement. 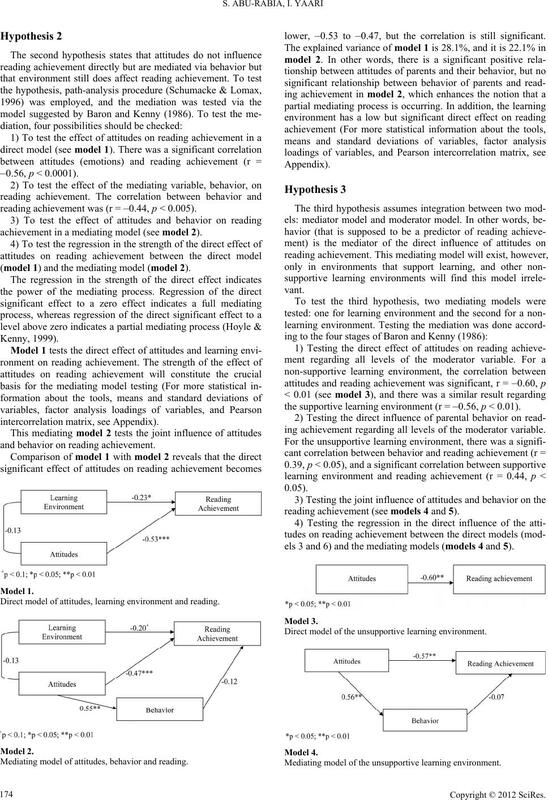 Direct model of attitudes, learning environment and reading. 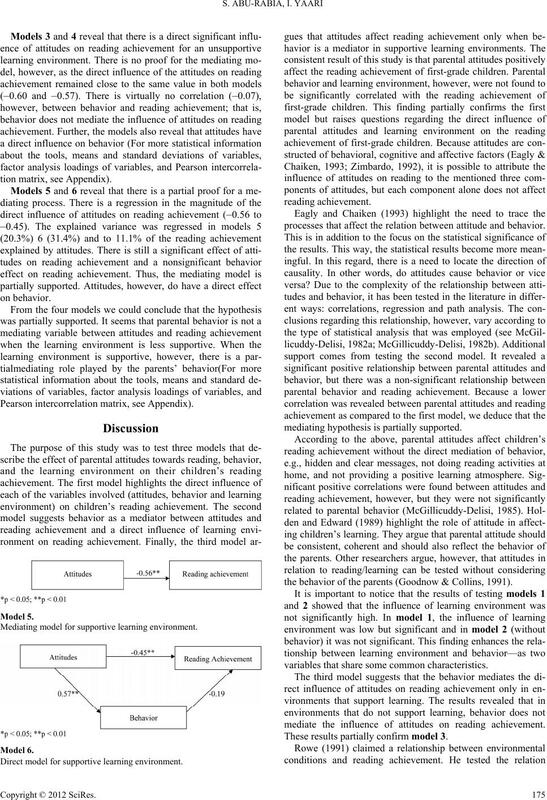 Mediating model of attitudes, behavior and reading. lower, –0.53 to –0.47, but the correlation is still significant. the supportive learning environment (r = –0.56, p < 0.01). ing achievement regarding all levels of the moderator variable. reading achievement (see models 4 and 5). els 3 and 6) and the mediating models (models 4 and 5). Direct model of the unsupportive learning environment. Mediating model of the unsupportive learning environment. Pearson intercorrelation matrix, see Appendix). Mediating model for supportive learning environment. Direct model for supportive learning environment. processes that affect the relation between attitude and behavior. mediating hypothesis is partially supported. the behavior of the parents (Goodnow & Collins, 1991). variables that share some common characteristics. mediate the influence of attitudes on reading achievement. These results partially confirm model 3.
methods used in the analysis of the data. overall relationship between them is still not clear, however. ment is direct and statistically significant. ing social behavior. Englewood Cliffs, NJ: Prentice Hall. 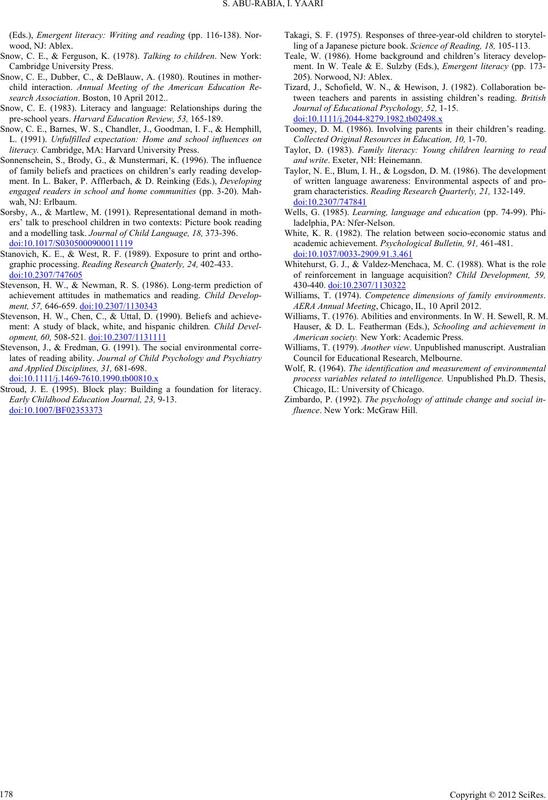 for Research in Child Development, 53, 1-139.
ences on the development and practice of literacy. In: H. Goelman, A. A. Oberg, & F. Smith (Eds. ), Awakening to literacy (pp. 24-37). children. Perceptual and Motor Skills, 70, 1387-1392.
lations. Psychological Review, 86, 452-464. Boocock, S. P. (1972). An introduction to the sociology of learning. up study. Child Development, 5 5 , 803-809.
ceptual and Motor Skills, 44, 1231-1237. Clark, M. M. (1976). Young fluent readers: What can they teach us? children succeed or fail. Chicago, IL: University of Chicago Press. Clay, M. M. (1972). Reading: The patterning of complex behaviour. mental process variables that are related to educational achievement. Ph.D. Dissertation, Chicago, IL: University of Chicago. Davie, R., Butler, N., & Goldstein, H. (1972). From birth to seven. children. Perceptual and Motor Skills, 78, 1303-1311. York, NY: Harcourt Brace Jovanovich College Publishers. Eccles, J. (1983). 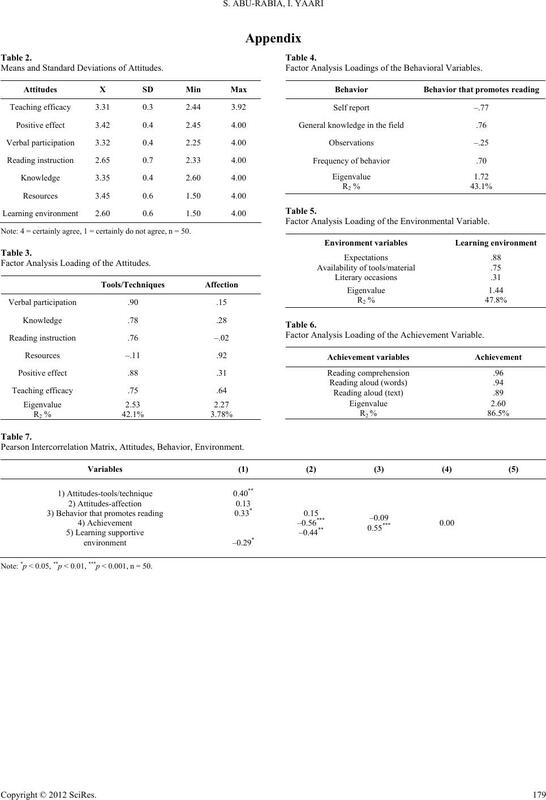 Expectancies, values and academic behaviors. In J. T.
Ellis, H. (1926). A study of British geni u s. Boston: Houghton Mifflin. (pp. 204-243). New York: Guilford. 215). Newark, DE: International Reading Association. parents: The nature, sources and consequences of parents’ ideas. rents: The nature, sources and consequences of parents’ ideas. In: H.
in the school entry years. International Conference on Infant Studies. reading attitude. Elementary English, 46, 17-24.
munities and classrooms. New York: Cambridge University Press. grounds. American Journal of Orthopsychiatry, 41, 416-426.
research, 7, The family. Chicago, IL: University of Chicago Press. Hess, R. D, Holloway, S. D., Dickson, W. P., & Price, G. G. (1984). later achievement in vocabulary and mathematics in sixth grade. Hess, R. D., Holloway, S. D., Price, G. G., & Dickson, W. P. (1982). as learning environments for children. New York: Plenum. tainment. 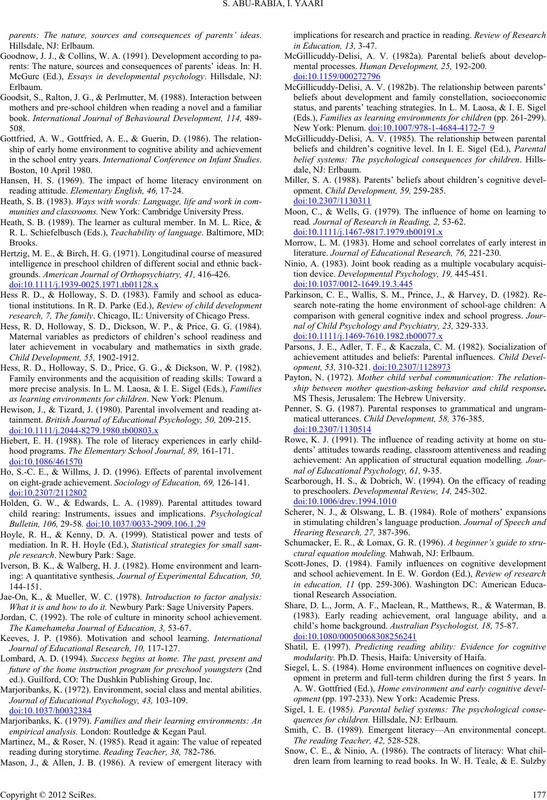 British Journal of Educa t ional Psychology, 5 0 , 209-215.
hood programs. The Elementary School Journal, 89, 161-171.
on eight-grade achievement. Sociology of Education, 69, 126-141.
ple research. Newbury Park: Sage. What it is and how to do it. Newbury Park: Sage University Papers. Jordan, C. (1992). The role of culture in minority school achievement. The Kamehameha Journal of Education, 3, 53-67. Journal of Educational R esearch, 10, 117-127. ed.). Guilford, CO: The Dushkin Publishing Group, Inc.
Marjoribanks, K. (1972). Environment, social class and mental abilities. 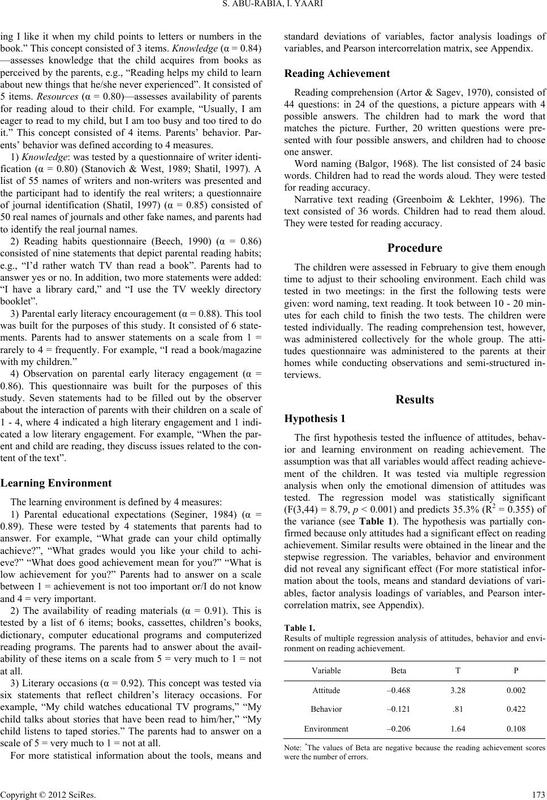 Journal of Educational Psychology, 43, 103-109.
empirical analysis. London: Routledge & Kegan Paul. reading during storytime. Reading Teacher, 38, 782-786.
mental processes. Human Development, 25, 192-200. (Eds. 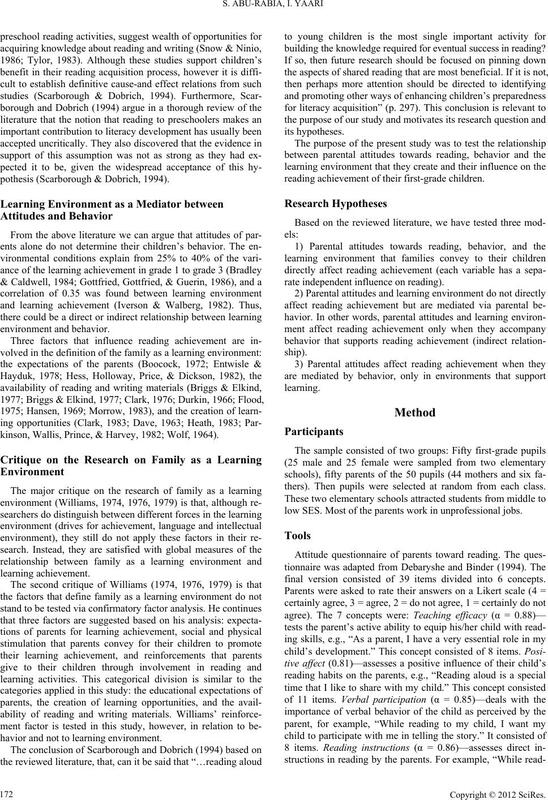 ), Families as learning environments for children (pp. 261-299). opment. Child D e velopm en t , 5 9 , 259-285.
read. 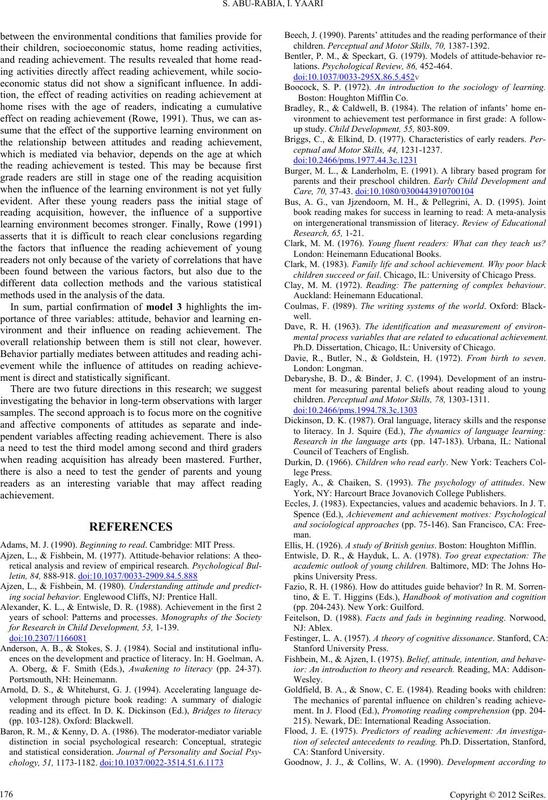 Journal of Research in Reading, 2, 53-62.
literature. 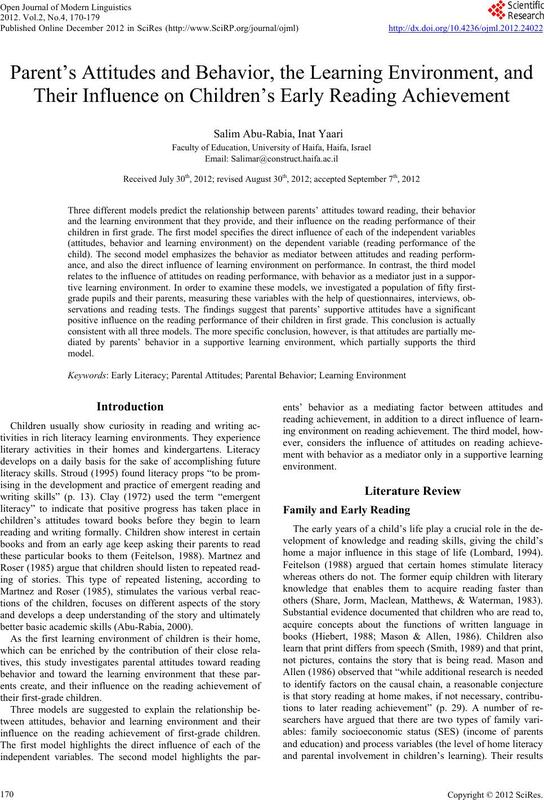 Journal of Educational Research, 76, 221-230.
tion device. Developmental Psycholo gy, 19, 445-451.
nal of Child Psychology and Psychiatry, 23, 329-333.
ship between mother question-asking behavior and child response. MS Thesis, Jerusalem: The Hebrew University. matical utterances. Chi l d D e v elopment, 58, 376-385.
nal of Educational Psychology, 61, 9-35.
to preschoolers. Developmental Review, 14, 245-302.
ctural equation modeling. Mahwah, NJ: Erlbaum. Share, D. L., Jorm, A. F., Maclean, R., Matthews, R., & Waterman, B.
child’s home background. Australian Psychologist, 18, 75-87.
modularity. Ph.D. Thesis, Haifa: University of Haifa. opment (pp. 197-233). New York: Academic Press. quences for children. Hillsdale, NJ: Erlbaum. Smith, C. B. (1989). Emergent literacy—An environmental concept. The reading Teacher, 42, 528-528.
search Association. Boston, 10 April 2012..
pre-school years. Harvard Educati on Review, 53, 165-189.
literacy. Cambridge, MA: Harvard University Press. and a modelling task. Jou rna l of Chi ld Language, 18, 373-396.
graphic processing. Re a di ng Research Quaterly, 24, 402-433.
and Applied Disciplines, 31, 681-698. Stroud, J. E. (1995). Block play: Building a foundation for literacy. Early Childhood Educatio n J ournal, 23, 9-13.
ling of a Japanese picture book. Science of Reading, 18, 105-113. Journal of Educational Psychology, 52, 1-15. Toomey, D. M. (1986). Involving parents in their children’s reading. Collected Original Resources in Education, 10, 1-70.
and write. Exeter, NH: Heinemann. gram characteristics. Reading Research Quarterly, 21, 132-149. Williams, T. (1974). Competence dimensions of family environments. AERA Annual Meeting, Chicago, IL, 10 April 2012. Williams, T. (1976). Abilities and environments. In W. H. Sewell, R. M.
American society. New York: Academic Press. Council for Educational Research, Melbourne. Chicago, IL: University of Chicago. fluence. New York: McGraw Hill. Means and Standard Deviations of Attitudes. Note: 4 = certainly agree, 1 = certainly do not agree, n = 50. Factor Analysis Loading of the Attitudes. Factor Analysis Loadings of the Behavioral Variables. Factor Analysis Loading of the Environmental Variable. Factor Analysis Loading of the Achievement Variable. Pearson Intercorrelation Matrix, Attitudes, Behavior, Environment. Note: *p < 0.05, **p < 0.01, ***p < 0.001, n = 50.